Check out the attached picture from this past weekend, 195.9 was the official weight. I finally got to shoot the gun, I love it!! Two shots and two yellowfin! Can't wait to get back out there. I'll look through my pictures and see if your gun is in any of them, and I'll get it out to you. As for the story, it went like this. We started our day late with intentions of going grouper fishing, but on the way out we came across a drifting trawler with some sort of mechanical problem. We talked with the guy on the deck, and he told us that there were no fish following them, but decided to try anyway. After a couple of minutes of chunking bait, the bonita and the sharks arrived. Shortly after, we were in the middle of a hot blackfin bite, and boated 11 or so. I decided to deep jig for some yellowfin, because the sharks were getting too thick on the surface to get a cut bait down. After a couple of drops with a big curly tail, I was hooked up with a nice yellow (70lbs +/-). This was all the proof we needed to identify the readings on our bottom machine. I was the only one on board with any dive gear, and after a little encouragement from my friends, I was ditching the rodnreel and grabbing for my gun. I dressed out and got into the water, but quickly realized just how bad the conditions were. Viz was 15-20', the jellyfish and sea lice were thick, and the sharks were up close and personal, showing no fear, behaving more like cats than sharks (rubbing on my legs and gun). On my first drop, I shot a nice football (25-30lbs). The gun tracked with ease and put the shot right where it needed to go, and on a small feeding tuna, that's saying something. My second drop was uneventful, plenty of fish, but no size to them, so I waited. My boat was keeping up a steady flow of chum, so there was no shortage of action both above and below the waterline. 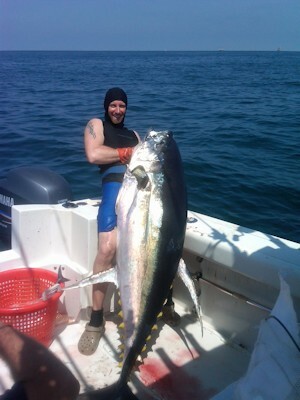 I new the yellowfin were there having seen them on the sonar, I figured it was just a matter of time. The third dive was the charm. I reached 50' and just hung out and waited. The bonita were schooling around me in a circle with nice blackfin and juvenile yellows darting by to grab the bits of chum. Then from my right hand side, a big solitary yellow appeared and almost gave me a broadside shot, but at the last second he turned providing my with a quartering shot to his left side at about 15' or so. Perfect! I shot him on instinct, just like a snapper. I went for the kill shot and almost rolled him. The shot penetrated the head through and through, and never came out until we removed it in the boat. The break away never got a chance to engage. Good thing for the shot placement, because I only had 50' of bungee and one Rob Allen float. He gave only a little fight, never pulling the bouy under, and was in the boat within what felt like 20 minutes or so. After celebrating in the boat we realized that we still had a livewell full of hardtail, so off we went to the deep water to do a little bottom fishing. In short order we topped of a picture perfect day with a 93lb Warsaw and headed for the dock. Simply unforgetable! On another note, I managed to ruin the t-shirt I got from you, so if you have any in stock I would like to order two large ones. Great gun, couldn't be happier with it. Talk to you soon.